Central location, easy to find. Ideal for anyone attending a concert at the arena (2 minute walk). Hotel was immaculate with all the facilities you need. Surrounded by restaurants and bars but no noise disturbance noted. Would recommend and use again. location was perfect as i'd stayed near this before. View from room was to front and fantastic panorama of exchange street. Kitchen allowed me to make my own breakfast which was required as I traveled for the marathon. Beautiful large room loved the kitchen facilities very clean very friendly staff, will definitely be back !! The staff were excellent they were friendly, good humoured and professional. You have recruited a brilliant team of people. Marcel and his colleague gave us a really warm, natural and thorough arrival, which set the tone for the whole experience. Thank you so much. The location is excellent and the room and facilities are great . The hotel is in such a good location. The staff upgraded us free of charge with it being my partners birthday. The host on reception couldn’t do enough for us. Faultless service. 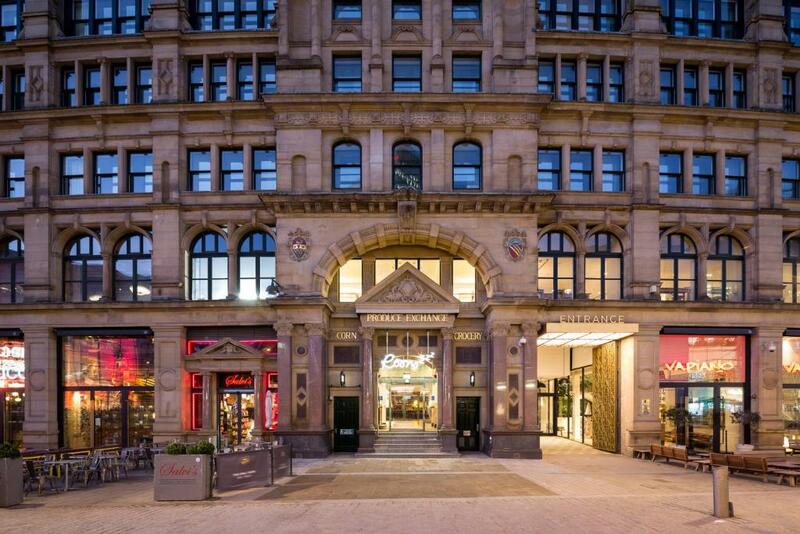 Lock in a great price for Roomzzz Manchester Corn Exchange - rated 9.3 by recent guests. 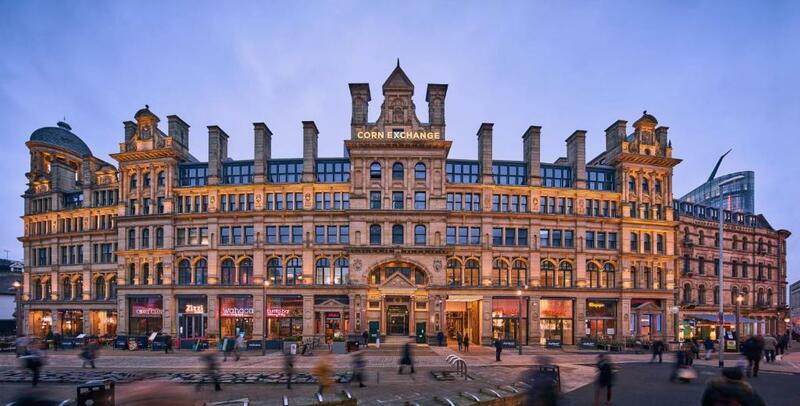 Featuring accommodation with free WiFi, air conditioning and an on-site gym, Roomzzz Manchester Corn Exchange is situated in a Grade II listed building next to Manchester Arndale shopping centre and only a 4-minute walk from Manchester Arena. 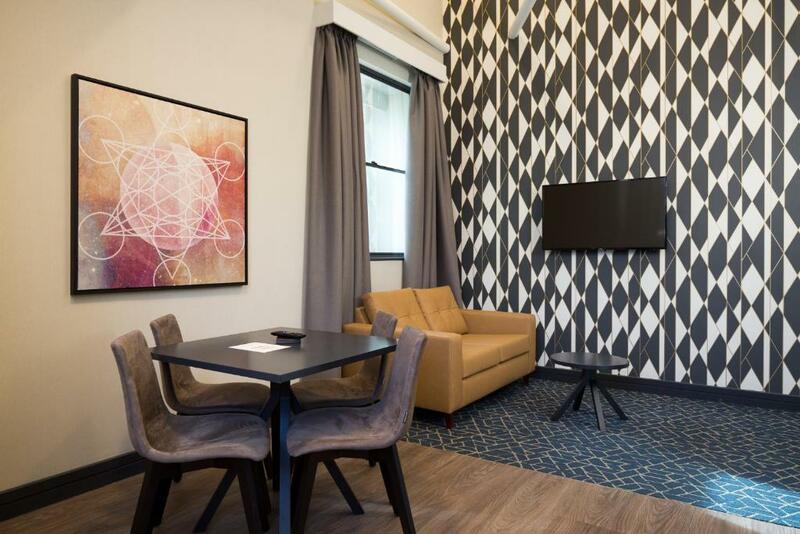 All units comprise a seating area with a sofa and a fully equipped kitchenette with various cooking facilities, including a dishwasher, a microwave, a toaster and a fridge. Guests at the apartment can enjoy a complimentary Grab & Go breakfast, including freshly baked pastries, fruit, hot drinks and juice. There is a variety of restaurants located downstairs in the Corn Exchange. A 24 hour shop and concierge are also available. Manchester Central is 1,000 yards from Roomzzz Manchester Corn Exchange, while The Opera House is 1,000 yards away. Roomzzz Manchester Corn Exchange has been welcoming Booking.com guests since 3 Jan 2018. When would you like to stay at Roomzzz Manchester Corn Exchange? This apartment features a seating area, microwave and sofa. This apartment has a electric kettle, seating area and microwave. 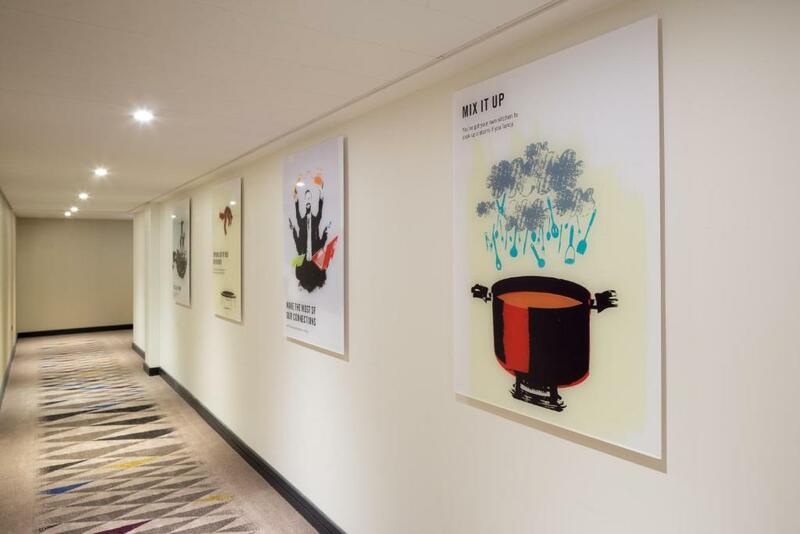 House rules Roomzzz Manchester Corn Exchange takes special requests - add in the next step! A damage deposit of GBP20 is required upon arrival. This deposit is fully refundable 7 days after check-out as long as there has been no damage to the property. Roomzzz Manchester Corn Exchange accepts these cards and reserves the right to temporarily hold an amount prior to arrival. Please note the grab and go breakfast is available between 6.30 - 10.30. Please note, the property cannot accept cash payments. Because my mum booked it for me as a birthday treat using her credit card I had to take her card with me for the £20 damage deposit which was not ideal. Studio Room, alittle to small for 2 people. If I booked again would need to book larger apartment. Nice Kitchen area to prepare food however no table to sit and eat for 2 people. Great location, clean, quiet and comfy! Breakfast offering limited. Sadly they also didn't get arounf to visiting my room for maid service until mid-late afternoon. By then i'd returned from doing a marathon and couldn't leave the room. For that reason I have to clean myself as much as possible and make do with same sheets/towels. Not end of the world but for price you'd hope they'd know why i was there and likelyhood I'd need room again later that day. 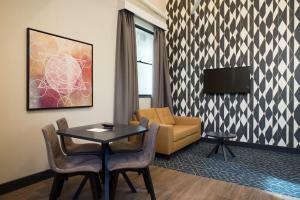 Great location, modern room, great facilities. Good room, friendly staff, great location.